Family & Friends are invited to attend Family Visitation on Friday April 12, 2019 from 6p.m.-8p.m. and Funeral Services Saturday April 13, 2019 at 10a.m. both at Meador Funeral Home, 1204 E. California Street Gainesville Texas, 76240. Pall Bearers are: Jason “Toad” Harendt, Joe Sicking, Colby Calhoun, Tommy Boaz, Carl “Bo” Miller, James Roe. Honorary Pall Bearers: Allen Shelton and Jack McCain (yes that Jack). George went home to be with his Lord & Savior surrounded by his family in peace in the early morning hours of April 9, 2019. He was 74 years old. George was born and raised in Gainesville, Texas and was a life-long member of Calvary Baptist Church, which he thought of as his home away from home. His life was a living example of hard work, stubbornness, humility, and rock-solid Faith in God. He was a dedicated father, grandfather, and great grandfather who took great pride in his family. He was a pillar of patience, brevity, and humor. He touched each and every life that he encountered. No unfavorable words have ever been heard regarding George. He was one in a trillion and the last of a dying breed of respectable, honorable old cowboys. He would gladly give you the pearl snap shirt off his back than to see any one of God’s creatures struggle or suffer. He has traveled the United States, done anything and everything for work. He spent the better part of three decades at Texas Trailer Corp in Gainesville Texas, where he is undoubtedly one of the most respected & cherished employees in the company’s history. He had a life-long love affair with Chicken Fried Steak, his scratch-made sourdough biscuits, homemade Apricot Jalapeno Jelly, peach cobbler, and was quite the cook. He excelled at gardening, herding cattle, driving a tractor, living within his means humbly, telling stories about him and his best friend Jack’s exploits, reading every Louis La’Mour book ever written, and the Texas Waltz. He is preceded in Death by his Wife Pat Caraway-Bryant, brothers Troy Bryant Jr, David Bryant, and his mother and father Irene and Troy Bryant Sr. He is survived by his brothers & sisters Harold & Marynell Bryant of Sulpher Springs Texas, Tamera Bryant of Columbus Ohio, Karen Parkhill of Valley View Texas, JoEllen Fisher of Gainesville Texas, his children Cody & Brenda Bryant of Potosi Texas, Kim Barber of Woodbine Texas, Mark & LeAnn Callihan of Valley View Texas, Mike & Shanna Callihan of Gainesville Texas, & Terra Greene of Gainesville Texas. He has 11 grandchildren, & 16 great-grandchildren, numerous nieces & nephews, cousins, and lifelong friends. 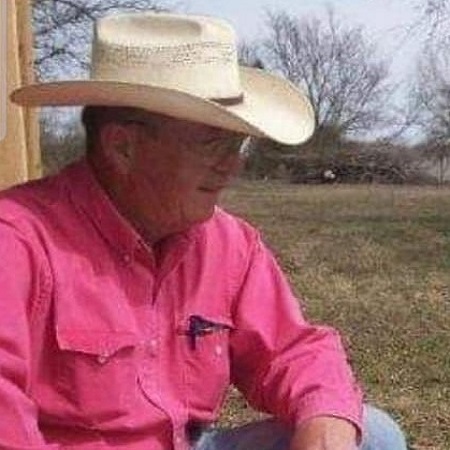 He taught them how to weed & till a garden, to always put your tools back where you get them and out of the weather, the proper way to swing a rope to head or heel cattle, to own up to your mistakes, and to be thankful for who and what we have, and to take care of the ones we love. He lived 1,000 years in the 74 calendar years we all had him because he enjoyed life. He grabbed it by the lapels, kissed it, and swung it back on the dance floor for another waltz or two-step. His life was full of love, laughter, and light. He will be sorely missed. As an expression of sympathy, donations may be made to the American Cancer Society(cancer.org) or to The Cowboys Who Care Foundation(cowboyswhocare.org). George was a great friend and brother in Christ. Our prayers are with his family. So sorry to hear about your brother, Tammy, prayers for you. Karen,Tammy and Jo I’m sorry about y’alls loss. May George Rest in Eternal Heavenly Peace. Prayers for the family and condolences to y’all. George’s childhood “home” was a house on Roy Street in Gainesville and he lived about 75 yards from my family. An alley separated our properties. One Christmas morning, i think it must have been around 1950, a horse appeared in the alley and George stumbled upon it as Irene and Troy looked proudly upon the scene. Santa Claus, it seemed, had delivered George’s very first horse. And from my perspective, that was chapter one of a very special epic on Earth starring George Larry Bryant. I got to grow up with a real cowboy and it was a joy. There were no “drug store cowboy” thoughts in anyone’s mind and George didn’t care about starring in anything. He appeared very happy, and my thoughts were that he recognized from whence cameth his help. George always had a kind word and a smile to share. Rest in Eternal Peace.